We watched the documentary and were blown away by it. It has a very different feel to the previous three documentaries. This one feels personal. A fitting tribute to a wonderful man. Read our review and thoughts on Back in Black later in this issue. This month we've been to see Feet of Clay in Abergavenny and will soon see The Amazing Maurice and His Educated Rodents in Cardiff. I am sure the two productions will be very different as every theatre company tends to put their own mark on them. We are also going to see another production in Bolton in March and possibly another in June. It looks like 2017 is going to be another bumper Discworld year for stage productions! The plaque will be unveiled at the library, in Reynolds Road, where Sir Terry was a Saturday boy and returned to give talks. Retro Gamer magazine (retrogamer.net) issue 164 features an eight page article about the three Discworld computer games released in the 1990s. The interview with Gregg Barnett and Chris Bateman (the games' creators) tells how they translated the written word into a successful series of computer games. Take a look over at The Foundry Community Forums (community.thefoundry.co.uk) and get a sneak peek at some of the amazing work that the team at Snowgum have been producing. NOTE: It appears that the above link no longer works... or only works if you are a foundry member. As of 23rd February we did find the following Troll Bridge: Work In Progress at TheFoundry. The Museum of Pop Culture (MoPOP mopop.org) announced a new exhibition commemorating the 20th anniversary Science Fiction and Fantasy Hall of Fame and named the new inductees for 2016. The Hall of Fame honours the lives, work, and ongoing legacies of science fiction and fantasy's greatest creators, and as the program marks its 20th year, it has expanded eligibility to recognize the genre's most impactful creations. If you might be interested in getting involved in any capacity (backstage or on stage) in their October production of Mort, go along and find out more. [Updated: USA] The Fourth North American Discworld Convention - THE GENUAN ™ EXPERIENCE - 1st-4th September 2017 at The Sheraton New Orleans. We assume any correspondence is eligible for use in the newsletter unless otherwise stated, including the sender's email address. We may edit your letters with a view from another dimension. From the Wilf the God of Astrology (signified by the 3 stars on his bow, and who has a cup of tea and then pushes off) to the Professor of Astrology at UU, STP also describes many of the Houses of the Zodiac and their attributes. There are 13 houses in the DW astrology, all of whom have a multitude of signifiers, which leads me to believe that the DW must have a small host of small stars and constellations that follow it through the firmament. These seem to have a small connection to Roundworld astrology but only in the same way an umbrella resembles a house!! I will be submitting a short series on the DW astrology and how it relates to Roundworld astrology in the months to come. 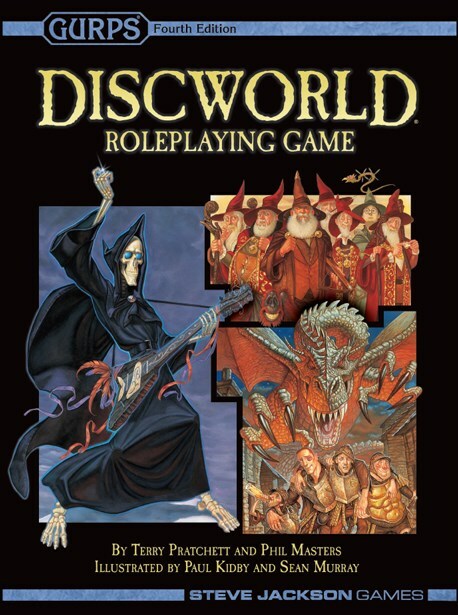 The Discworld Roleplaying Game has been published by Steve Jackson Games. For those who are interested it is a standalone game with no other purchases needed and it is based on the GURPS RPG system. As well as being available online (sjgames.com) it is presumably available at gaming stores. 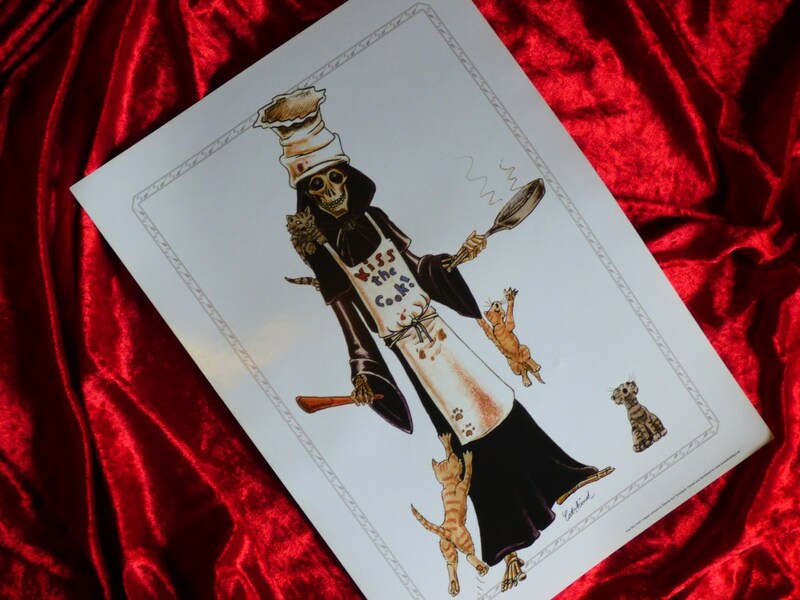 Discworld Monthly replies: We did advertise that this would be available back in December. In fact we ordered our copies in November but sadly our supplier has had stock issues and still hasn't been able to fulfil our order. Once we get a copy we'll write a review. In the meantime David Northey has written a first look at Gurps Discworld later in this issue. I'd like to draw your attention to my blog post All fur coat and trousers, in which I address the misspoken phrase, 'All mouth and no trousers', which should of course be 'All mouth and trousers'. Editor's Note: Lucy has decided that she no longer wants her letter published. We have therefore removed it upon her request. The main reason for writing is this: - I understand Terry tried to add a finish/ending to his series of books, but as an avid reader of his whole output, I believe there is still some closure to be achieved for his sake and mostly for his many fans. I did have some good ideas on a final and closing novel, Mostly centered around Susan, her Grandfather, (and the 3 other horsemen), Sir Vimes, Rincewind, and of course the Luggage!! There are several other bit players involved in the story, the Monks of History do have a brief appearance! Sadly with Granny Weatherwax's passing she will have to be left out of the book, both the Librarian and Death of Rats have also parts to play! Jason Anthony (Editor) replies: Terry made it very clear that all work in progress was to be destroyed upon his death. Rob his assistant and Rhianna his daughter have agreed to respect his wishes by not publishing any of the material. Rhianna has also stated that she considers Discworld to be sacrosanct and that nobody will be allowed to continue the series. Though we won't get any new material we will still get new screen and stage adaptations. Next year we will get the Good Omens six-part television series. It's also been announced that The Wee Free Men will be adapted by The Henson Company with the screenplay being written by Rhianna. We are sure that there are several other projects in the pipeline but no real details are yet available. Discworld Monthly went to the opening night, Thursday 26th January, of Feet of Clay at the Borough Theatre in Abergavenny. We've never visited the Borough Theatre before and we'd never seen Feet of Clay performed live. Feet of Clay ran until Saturday 28th January. The auditorium is quite large and can seat around 350 people, the stage is also wide and quite deep. On the opening night I estimate that about 30% of the seats were occupied. We don't know how big The Abergavenny Theatre Group's pool of actors is BUT we have to say that soon after the performance had started we felt that something wasn't right. In our opinion you need a very strong Vimes to pull off a successful Watch production and in our view John Geraghty just wasn't the right actor. Vimes came across as bumbling rather than the confident and dogged investigator we've come to expect (especially as by the time we get to the events in Feet of Clay Vimes has already given up the drink and married Lady Ramkin). Personally we would liked to have swapped the actors playing Colon and Vimes around. The two leading ladies, Mari-Anne Gibson as Angua and Clare Jabob as Cheery Littlebottom, really stole the show though - their performances seemed natural and they seemed to both be enjoying their roles. Les Hayes was also a lot of fun as Dragon King of Arms. 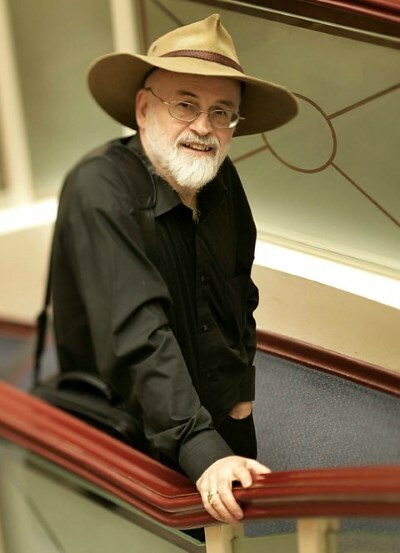 We think that it was clear that some of the actors had never read any Pratchett before or certainly didn't understand their characters. Detritus, for example, was far too upbeat and happy, where we would expect him to be slow and plodding - it was as if he'd taken a load of Slab just before the performance. We also think they tried far too much with making Nobby deformed. Nobby we're sure shouldn't have a hunchback, horns and a huge animal foot sticking out of one boot. We also noticed that a lot of the cast was very young - this apparent lack of experience seemed to pop up throughout the play. During the first act there was a lot of prompting needed and there seemed to be a lot of timing issues. There were times where things seemed to just come to a complete halt for a bit too long to be comfortable. We think we can put a lot of the issues with the first act down to first night nerves because the second act flowed much more smoothly. The actors seem to have settled into their characters a little better and the performances certainly seemed more natural. The question remains though - did we enjoy the performance? Maybe we've been really lucky with the previous productions we've seen and our expectations are that much higher. Maybe it needed just a little more direction from the production team to polish up some of the performances. Overall though it was a fun and very entertaining evening and we'd certainly consider making the 100+ mile round trip again to see The Abergavenny Theatre group perform another Pratchett production. The randomly selected winner is Robert Elliott from Oxfordshire. We'll package up your prize and get it into the post to you as soon as possible. UK residents can also purchase a digital copy to keep via digital download from the BBC store at: BBC Store - Back in Black it costs 1.89 GBP for the standard definition or 2.49 GBP for HD. Now you've seen the new documentary you can take a look at some behind the scenes photos (Back in Black - Behind the Scenes) that were taken while filming. The theatre is dark. The stage is almost empty, bar a couple of benches and a small pile of clothes. A girl walks in, isolated, alone, silent, and in the dark begins to cut her hair. This as we all know is Polly Perks becoming Oliver. The story behind Monstrous Regiment is dark, and one that, elements at least of which, have been replayed throughout military history. Dealt with through STP's usual medium of fantasy walking hand-in-hand with reality, dark humour and punching critique, the story is one which many of us know well, and one the director (Imogen Higgs) clearly knows well too as she has created an excellent interpretation of it. Simple, minimalist staging and props allowed the story to flow well and exposed some really excellent acting, to the point where I am not sure which was my favourite. Actually, I tell a lie, it was Private Maladict. Not only is the vampire my favourite character in the book, the acting by Paul Cresser was brilliant. 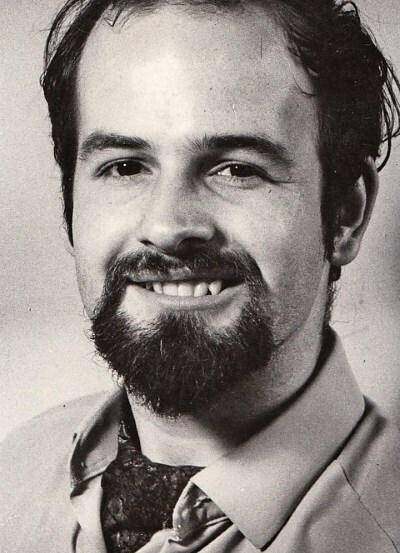 Or possibly Jackrum (Stephen Fenerty) who really caught the spirit of the Sergeant. Private Polly (Oliver/Ozzer) Perks (Frankie Payne) of course was the star of the show, and she was spot on with the role, clearly a very talented actress, she handled the character extremely well throughout. In fact, given that this is a relatively small company who'd never done an STP play before, everyone was extremely good, my only slight concern might have been that while Adam Taussik was excellent as Captain Horentz, his Vimes was, at the start, too posh, too conceited, not earthy enough. But perhaps this is only something that someone who knew the character quite so well would pick up on. Even Imogen, the director, did a wonderful job standing in as Private 'Shufti' Manickle due to a cast illness, I don't doubt full of nerves but it didn't show. Costume-wise the complete show stealer was Carborundum. I've seen a few troll costumes in my time (now there's a sentence you never think you're going to need to type!) but that has to be by far the best, although apparently it gets very warm in there. Adam Warren did a great job acting under all that too. Myself, the husband and the brother-in-law tramped over to see this production last week. As an audience combination we probably reflect every configuration of Terry Pratchett understanding, myself the avid STP nut, owning all the books (and a fair amount of Emporium, Paul Kidby and Discworld Monthly merchandise! ), Rob (husband) who likes to read the books occasionally, but hasn't got through them all yet, and Stu (B-i-L), who has never read a single Pratchett book in his life (I know, there are still some people out there who have survived without it, I was shocked too). The production was put on at the Nuffield Theatre, which it turns out is a little purpose-built modern theatre set in the heart of the Southampton University campus. Quite nice, no frills, and, particularly considering the heart of student-ville, decent beer at the bar. As Discworld Monthly's Rachel had nobbled me for writing this review for the newsletter, I'd actually been pre-approached by Bridget Wilkinson (who also gave an excellent performance of Private Igor as well as being the Publicity Manager) to let her know if I was going to be able to make it. That meant that when I arrived I had a programme waiting for me and people wanting to chat, everyone was extremely friendly and although it's the first time they have put on a Discworld play, it turns out there's quite a few Discworld fans in the cast and crew. 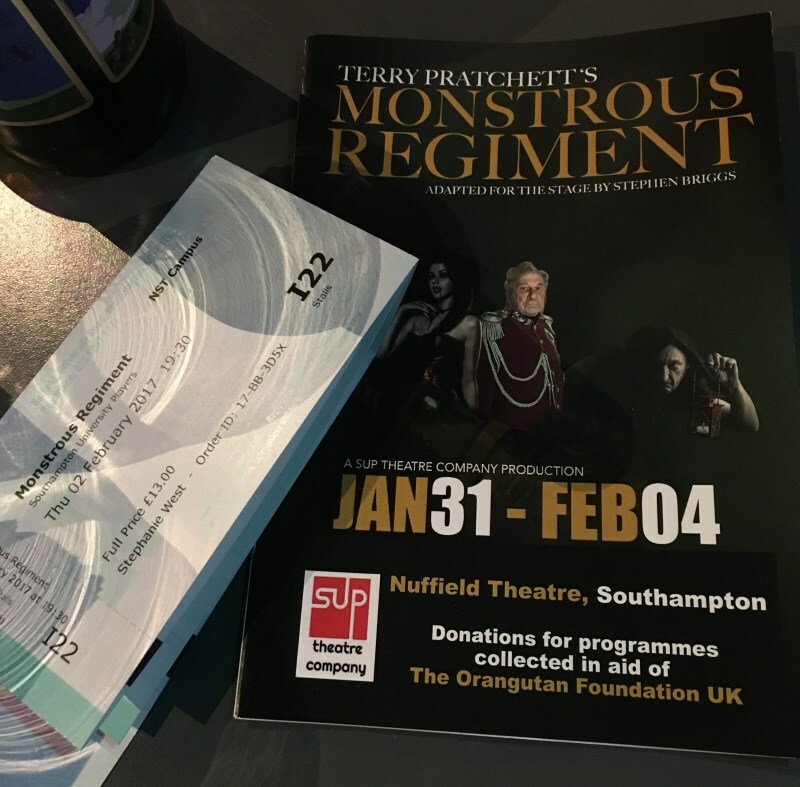 Given that for a cold Thursday evening in February the theatre was almost sold out, it looks like there's quite a few Discworld fans in Southampton too. After the show several of the cast popped out to the atrium to say hi and were quickly mobbed by eager audience members for photographs. It was lovely to have people coming up to say what fans they are of Discworld, and of Discworld Monthly, although I did have to disappoint one Discworld Monthly fan in the cast by admitting that I wasn't Rachel (I'm just not tall enough to pull that off!). GURPS Discworld RPG - A review by a complete novice to the GURPS/ D&D RPG genre. This rather thick tome (400 pages, plus a brief 1 page glossary, 2 pages of a bibliography giving a 2 line brief synopsis of the DW books up to and including Snuff and other GURPS publications, and a 5 page index) - credited as being by Terry Pratchett and Phil Masters and illustrated throughout by Paul Kidby and Sean Murray - is my first foray into the Dungeons and Dragons style of Role Playing games. What is required to play this RPG is this book and three 6-sided dice, so there is no need to go out to a gaming shop to buy some of those stranger multi-sided dice that are required in other D&D style games - their words, not mine!! There are 11 chapters in this book, all with line drawings by Paul and Sean throughout. The 1st chapter provides a brief overview of the Discworld, for those who may have picked up the book as they are fans of the GURPS games. Chapters 2 to 4 explain how to create human and non-human characters, setting up their skills, occupations, traits, influences, and quirks in quite minute detail - giving the non RPG person quite a lot of information to take in! They do go through how to setup an example character, in boxes at the side. To offset the information overload, there are quotes from the various DW books. Chapter 5 deals with how to play the game - when to roll the dice, who rolls, and how to decide the success or failure rates, magic, using weapons, how to set up the session, the Game Master (GM) role, how to create Non Player Characters (NPCs), and improving characters. Chapter 9 deals with setting up the Citizens of the Disc as playable and NPCs. Chapter 10 deals with the creatures of the Disc. Chapter 11 deals with the role of the Game Master - and gives some sample campaign settings. I am unsure whether this will be a regular game playing experience for me, as it looks highly complicated and I've never really played any D&D style games, but will be looking to give it a go in the near future.